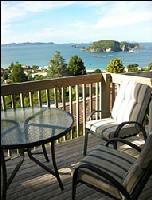 Situated above fabulous Hahei beach offering panoramic ocean views. Stroll to the beach and the historic Maori fort on the magnificent Te Pare Point headland. Walk from the beach or a short drive to enjoy the beautiful coastal walk to Cathedral Cove. Drive to nearby Hot Water Beach and dig your own hot-water pool in the sand. Close to all Hahei's cafes, restaurants, shops, garage and general store. Units 1 & 2 - 2-bedrooms (queen + 2 king single-size beds), wheelchair access. Units 3 & 4 - 1-bedroom (queen-size bed), lounge fold-out double sofabed. Units 6 & 7 - higher up the hill with private parking, 1-bedroom (king-size bed), lounge fold-out double sofabed, private balconies, large separate outdoor BBQ dining area. Units are linked by a connecting door and often used by families wanting an unforgettable holiday with awesome views. Unit 7 - has a fully-equipped kitchen.